Wales U19s manager Paul Bodin says his side are deflated but ready to bounce back after a 92nd minute winner gave the Netherlands a 2-1 win over Wales in their opening UEFA U19 European Championship Elite Round match. 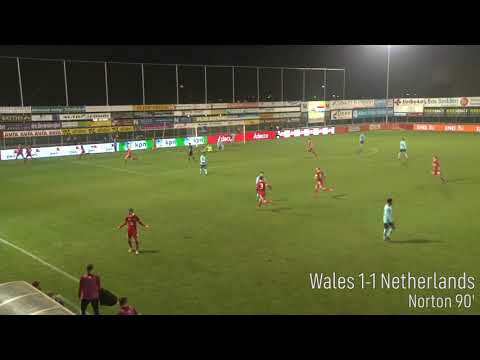 Wales started the match under pressure from one of Europe’s top sides with Juan Castillo penetrating space on the left-hand side, but the centre back pairing of Brandon Cooper and Ryan Astley dealt with the incoming deliveries. After twenty minutes Wales settled into the game and managed to create chances of their own, with Cooper hitting the post from a well delivered free kick. The only goal of the first half arrived in the 26th minute. A moment of magic from Castillo saw the Chelsea player find the back of the net with a superb left foot strike from 30 yards out, sailing past the hands of George Ratcliffe who had been playing a key part in keeping the Dutch at bay. The match sprung into life in the second half as Wales piled on the pressure to respond the game’s only goal. Winger Jack Vale became a big threat as the Blackburn Rovers player skipped past three Dutch players, but his drilled effort was only kept out by the foot of keeper Kjell Scherpen. Meanwhile, the midfield trio of Brennan Johnson, Dylan Levitt and Ryan Stirk took control of possession whenever possible and Levitt’s long-range effort from 35 yards out forced Scherpen into action to tip the ball over his crossbar. Despite the Welsh pressure, the Netherlands were also creating chances in what was an end-to-end second half. George Ratcliffe produced a superb performance to keep the Dutch out throughout the half, with several diving saves and quick reactions to keep his opponents at bay. Manager Paul Bodin made several attacking changes to find the all-important equaliser, which eventually paid off. A long-range ball from Levitt was flicked on by Johnson through to the path of substitute Christian Norton, who made no mistake in slotting the ball through Scherpen’s legs in the 90th minute. Following the late equaliser, there was heartbreak for Wales. The Netherlands won a free kick and a final attacking opportunity in the Welsh half and seized the opportunity as Van Den Berg’s header gave the hosts the three points in the closing stages. With the other game in the group ending Spain 1-1 Slovenia, Paul Bodin’s side still have an opportunity to qualify providing they beat the Spanish in their next match on Saturday. The Netherlands qualify for intermediate tournament finals year on year, so it was great that we stood up to the challenge. We’ve got Spain on Saturday who are the same standard. We had a lot of positives from the Dutch game and we know what we want to work on, the boys will be raring to go. Subs not used: 12. Adam Przybek, 4. Sam Bowen, 13. Jay Foulston, 14. Keenan Patten, 18. Callum Watts, 19. Cameron Evans.